Marian Goodman Gallery, New York and Galerie Marian Goodman, Paris, in conjunction with Yvon Lambert New York and Galerie Yvon Lambert, Paris announce the opening of The Unknown Artist, an exhibition by Giulio Paolini in four parts, which will be on view beginning December 14st through January 13th in New York, and from December 14th through January 27th in Paris. The opening reception, in four locations, will be held on Thursday evening, December 14th, 2006, from 6 – 8 pm. On the 14th, a shuttle bus will run every ½ hour from each location, between Marian Goodman Gallery, and Yvon Lambert Gallery, between 6 & 8 p.m. Playing the part of an anonymous curator, Paolini's project will conceive of a synthesis of four different exhibitions in four different venues (in New York and Paris) simultaneously, with each piece presented as a unit which refers to the whole of which it is a part. 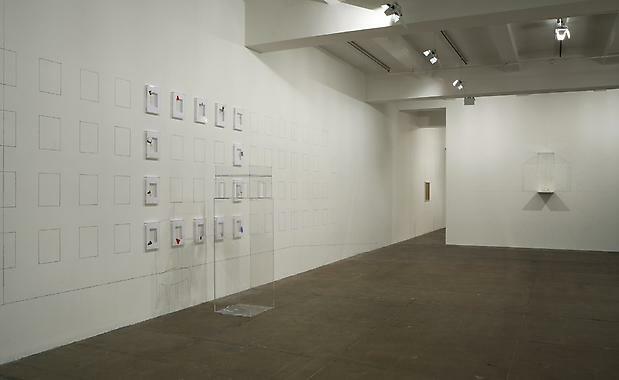 In the artist's text accompanying the exhibition, Paolini writes, "December 2006: Here and now: yes, now but where? In four different places, four different exhibitions will be inaugurated on the same day at the same time – each consisting in four works (which, in turn, consist in four, sixteen and twenty-four elements). Works of different sizes but all falling within the square proportion, a perfect geometric figure that neither gives nor asks for explanations: a portion of space circumscribed by four sides of equal size, which each finds itself in its own place but could find itself in the other's place. …. "As I have previously said and repeated, an exhibition is not the result, the sum total of a work phase or an anthology of works selected and gathered for the occasion. It is—and I would rather speak of the exhibition moment—a display of the works that, on that particular occasion, together form a sort of text, a picture story. Even the title of the exhibition project knowingly echoes The Unknown Masterpiece (Le Chef d'Douvre inconnu), the famous Balzac story with which I want these humble and imprudent intentions of mine to fall into complementary and symmetric line. I refer, in particular, to the part of the story where Frenhofer, the elderly painter and the main character, can not help intervening and making the necessary corrections, giving the final touch to the picture (not his but one by another painter, his friend and colleague Porbus) so that the work is remedied and can come to a successful conclusion. This passage clearly shows that a work does not belong to one artist or another; it possesses an autonomous and independent identity of its own and so existed before the painter stepped in, required only to confirm its legitimate existence. It is the work that guides the painter's hand, appropriating the artist (an unknown artist) and not vice versa". Giulio Paolini was born in Genoa in 1940 and now lives in Turin. 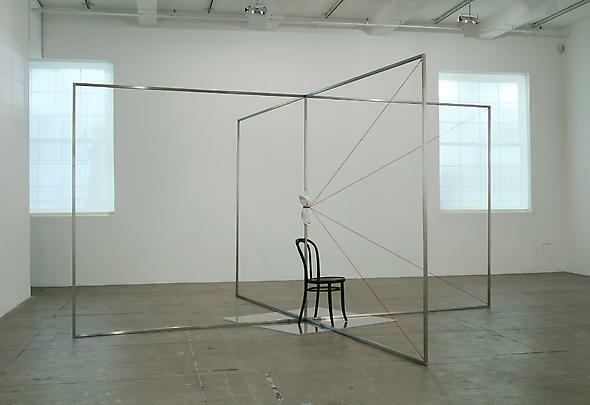 Of the artists whose work has been associated with the Arte povera movement, he has distinguished himself as the most conceptual of the group. 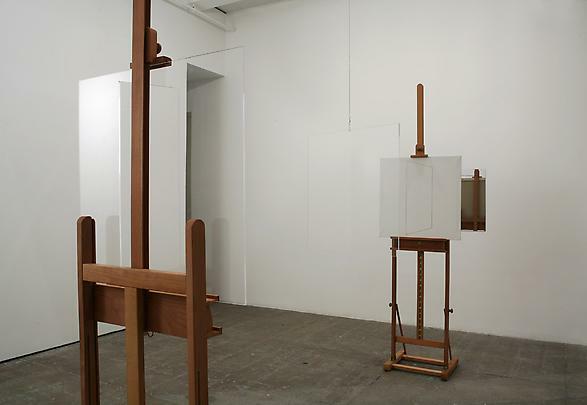 In 1984 he wrote, "Even if there has been a certain process which, over the last twenty years has achieved its own coherence in my work, I have never tried 'a priori' for this consistency. But I have always, little by little, picture by picture, searched for the 'immagine', the absolute image, with careful control. This has placed me in a conceptual realm…". Throughout his oeuvre, Paolini has, in his own words, focused on "an image of our system of focusing between picture space and object space: as in an ideal mirror which reflects phenomena but also lets us see what constitutes it" . His work is concerned with the tools and context of art and the exhibition space, and he has often utilized models of images or reproductive materials -- photography, lithography, and plaster casts of classical statuary– to explore the canon of art history, the notion of authenticity, and the interchangeable roles of artist and spectator in the construction of meaning. Interested by the mythos of why one makes art, Paolini has also been concerned with the exhibition itself as a work of art. 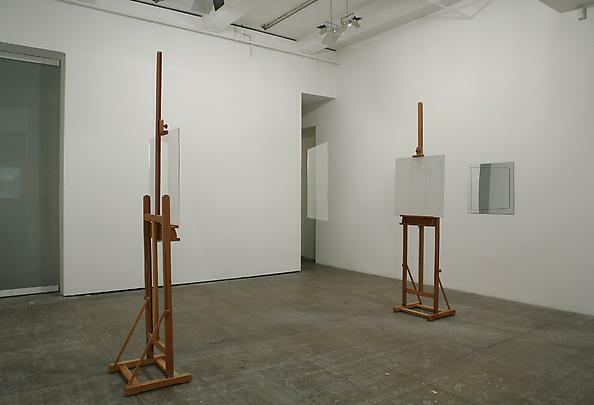 As Maddalena Disch writes, "The starting point for [Paolini's] work is his first piece dating back to 1960: "Disegno Geometrico", a tempera work on canvas, in which the artist limited himself to tracing the squaring of the surface, a procedure he views as coming before any possible depiction. 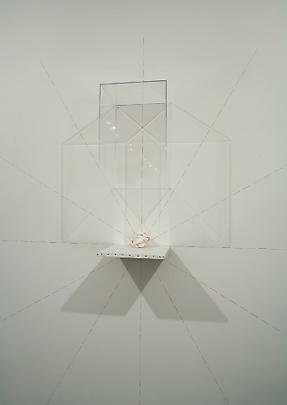 Starting from this initial reflection on the space of representation and the very constitution of the work, Paolini has, since this time, developed a complex research centered as much on the artist's tools as on the figure of the artist as an operator of language and accomplice of the viewer. 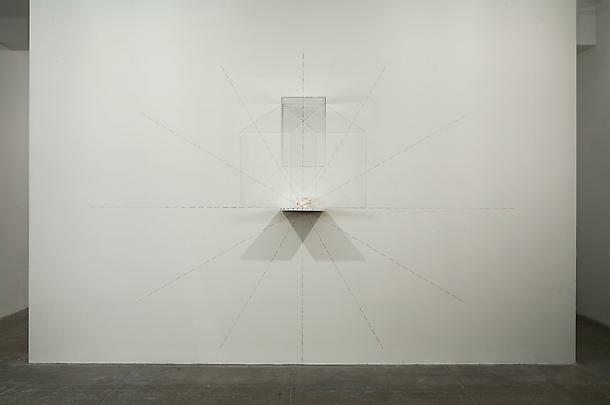 The main characteristics of his artistic expression include: citation, duplication, and fragmentation, which are used as expedients for staging the distance between a finished model and making the work a "theater of evocation." 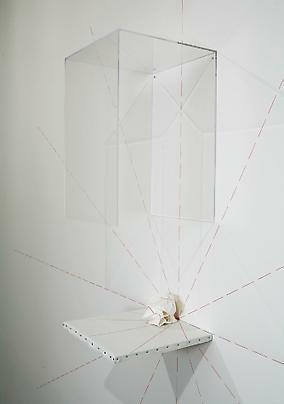 "Articulated and composed designs, centered on additive dynamics (ordering, repetition, juxtaposition) and centrifugal forces (explosions and dispersions starting from the centre) or centripetal ones (concentration, superimposition, joining), accompany procedures drawing from a vast store of cultural mythologies and memories that are captured in photography, collage, and plaster casts. 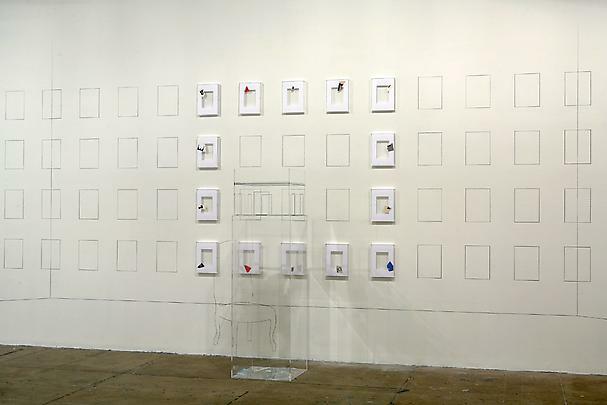 More recently, Paolini's incessant investigation of the definition and purpose of the work has been concerned with the act of exhibiting, which he sees as the fundamental moment of encountering the work." Since the mid-sixties Paolini's work has been exhibited in numerous venues around the world. Most recently, one-man shows have been presented at: Westfalisches Landesmuseum fur Kunst und Kulturgeschichte, Munster (2005); Kunstmuseum Winterthur, Winterthur (2005); Fondazione Prada, Milan (2003); Galleria d'Arte Moderna e Contemporanea Palazzo Forti, Verona (2001); Galleria Civic d'Arte Moderna e Contemporanea, Turin (1999); and Neue Galerie im Landesmuseum Joanneum, Graz (1998). His work has been included in numerous collective shows, beginning with his participation in Premio Lissone in 1961, as well as those associated with the Arte Povera movement, international shows of Italian art, and many exhibitions concerning artistic developments in the second half of the 20th c. Some of these include: The Last Picture Show: Artists Using Photography, 1960-1982, The Walker Art Center (2003-04) ; 1965-1975: Reconsidering the Object of Art, MoCA, Los Angeles (1995); Bilderstreit, Cologne 1989; Transformations in Sculpture, The Guggenheim Museum, New York (1985); The European Iceberg, Art Gallery of Ontario, Toronto (1985); An International Survey of Recent Painting and Sculpture, Museum of Modern Art, New York (1984); '60-'80: Attitudes, Concepts, Images, Stedelijk Museum, Amsterdam (1982); Westkunst, Cologne (1981); Europe in the Seventies, Art Institute of Chicago & Hirshhorn Museum and Sculpture Garden (1977-78); Projekte '74, Kunsthalle-Kunstverein, Cologne (1974); Information, Museum of Modern Art, New York (1970). His work has been in regular attendance at both Documenta in Kassel (1972, 1977, 1982, 1992), and the Venice Biennale (1970, 1076, 1978, 1980, 1984, 1986, 1993, 1995, 1997). Since 1969 Paolini has designed various theater sets for the stage, with the most recent project being the set design for Richard Wagner's The Valkyrie, at Teatro di San Carlo, Naples (2005, directed by Federico Tiezzi). He has also accompanied his artistic production with meditations and statements in the form of books and anthologies, such as his first collection of writings, Idem (Einaudi, 1975); and more recently, La verita in Quattro righe e novantacinque voci (Einaudi, 1996); as well as a trilogy published between 1994-98: Lezione di pittura, Black Out, and Giro di boa (Exit Edizioni). The artist's complete writings, Giulio Paolini: la voce del pittore. Scritt e interviste 1965-1995, was published by Edizioni ADV Publishing, Lugano (1995). Important monographs on the artist's work have been produced for shows in Parma (1976); Lucerne (1981); Ravenna (1985), Stuttgart 91986), Graz (1998), and Milan (2003). In 1990 Francesco Poli edited a monograph on the artist (Edizioni Lindau, Turin). A catalogue raisonné of the artist's work is currently being prepared. Please join us at the opening reception on Thursday, December 14th from 6 – 8 pm.